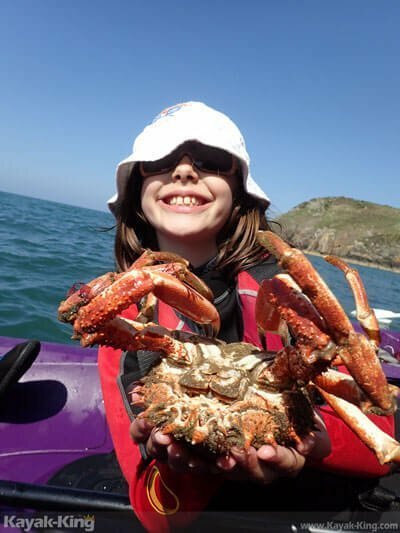 Gift voucher - Fun kayaking tours along the Pembrokeshire coast, Wales. Gift vouchers to Celebrate a special occasion like Birthdays, Christmas, Valentines or an Anniversary. A kayaking gift voucher makes the perfect present for friends and family. Give them the gift of an experience of a lifetime. Kayak-King tours are accessible to all ages and abilities and are tailored to the needs and aspirations of the customers. Using stable sit on top kayaks to venture out along the Pembrokeshire coast exploring the coastline by kayak. Paddle beneath towering sea cliffs and into sun-dappled caves. On our half day trips, we’ll take you to stunning locations in the national park while looking out for seals and bird life along the way. Our unique half-day tours, which last approximately 2 – 2.5 hours, allow you to actively enjoy and explore the region’s natural beauty. You’ll have a knowledgeable guide with you to keep you safe. Touring by kayak gives visitors an intimate view of Fishguard’s special corner of Pembrokeshire. A fantastic Half-Day Kayaking experience on the coast from Lower town Fishguard, Pembrokeshire, Wales. Use of specialist adventure equipment to keep the participants warm, happy and afloat. An experienced and knowledgeable guide to ensure enjoyment throughout the kayak tour.